knowledge of the buildability of tracks for plant to remote sites to meet such challenges. CEM/CRE when required, providing input at all stages of the GRIP process. 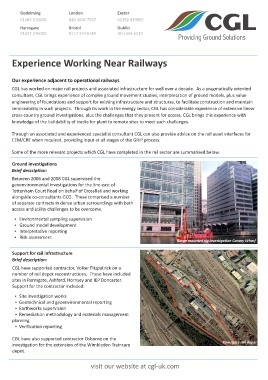 Some of the more relevant projects which CGL have completed in the rail sector are summarised below. access and utility challenges to be overcome. sites in Ramsgate, Ashford, Hornsey and IEP Doncaster.